Dictionary of Toxicology, Third Edition presents a compendium of definitions of all current toxicological terminology. This authoritative reference illustrates and describes words, concepts, acronyms and symbols for both the toxicological theory and applied risk assessment, as well as providing guidance on the correct selection of problematic, similar and frequently-misused terms. 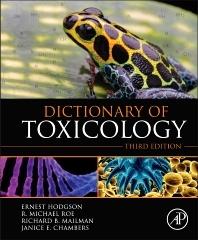 Written by one of the world’s foremost experts in toxicology, and with each entry peer reviewed, Dictionary of Toxicology, Third Edition is an essential reference for all scientific, medical and legal professionals who work with or encounter the toxicological effects of contaminants on biological systems. New to this edition: an update on every entry and the inclusion of all terminology and concepts relating to molecular toxicology, nanotoxicology and computational toxicology. Presents peer-reviewed definitions on the most up-to-date toxicological terms and concepts. New edition includes definitions within the fields of molecular toxicology, nanotoxicology, computational toxicology and risk assessment. Dr Ernest Hodgson, Distinguished Professor Emeritus, North Carolina State University and Executive Director, Foundation for Toxicology and Agromedicine was educated at King’s College of the University of Durham (now the University of Newcastle), Oregon State University and the University of Wisconsin. At North Carolina State University since 1961 he was a William Neal Reynolds Professor and Head of the newly formed Department of Toxicology. He was also one of the founders of the three university (East Carolina University, North Carolina State University and North Carolina A&T University) program in agromedicine, an organization which led to the formation of the North Carolina Agromedicine Institute. Dr. Hodgson has conducted research on xenobiotic biochemistry for several decades, has authored c. 400 peer-reviewed papers in this area, and is editor and part author of several monographs. Most recently his research has focused on human studies utilizing human hepatocytes and sub-cellular preparations. Currently involved as a collaborator with Dr Michael Roe in RNAseq studies of genome-wide effects of environmental chemicals. From 1961 until his retirement he was supported by extramural funding, primarily from NIH (NIEHS) and the US Army. Dr Hodgson is also editor and contributing author of toxicology textbooks (Textbook of Modern Toxicology and Molecular and Biochemical Toxicology, both currently in their 4th editions) and is a lexicographer (Dictionary of Toxicology, under revision for a 3rd edition and a Dictionary of Agromedicine, being created for the NC Agromedicine Institute). He is well recognized for his role as a teacher of toxicology. In addition to his role as editor and part author of textbooks he has trained some 40 graduate students and 20 post-doctoral research associates. His service on federal study sections and other federal panels has been extensive and includes the following agencies. NIH, NASA, US Army and others. He has been recognized by awards from the Society of Toxicology, the American Chemical Society, the International Society for the Study of Xenobiotics, the Consolidated University of North Carolina and North Carolina State University. He is a past president of the International Society for the Study of Xenobiotics. R. Michael Roe, Ph.D, is a William Neal Reynolds Distinguished Professor in the Department of Entomology and the Department of Environmental and Molecular Toxicology at North Carolina State University (NCSU) in Raleigh, NC and was elected as Fellow in 2012. He is internationally recognized for his research in insect and acarine physiology, biochemistry, genomics and toxicology and the use of fundamental research in chemistry, nuclear science and biology to solve practical problems and develop new commercial technologies. Dr. Roe was born in Plaquemine, Louisiana in 1952 where he graduated high school in 1970. He obtained his B.S. degree with a minor in chemistry from Louisiana State University (LSU) in Baton Rouge in 1974. He continued his graduate education at LSU obtaining a M.S. degree in physiology with a minor in biochemistry in 1976 and a Ph.D. in entomology and a minor in nuclear science in 1981. He was a NIH fellow in Cellular and Molecular Biology in the department of entomology at the University of California at Davis from 1981-1984 and in 1984 accepted a position as assistant professor in entomology at North Carolina State University, Raleigh. Dr. Roe’s laboratory focuses on understanding how insect and acarine systems function at the molecular level, the use of synthetic organic chemistry to understand structure-activity, and applications in bioassay, chemistry, molecular biology, and physics to solve practical pest problems in the context of integrated pest management. Dr. Roe also is interested on the impact of environmental chemicals on human health, focusing on global gene expression and epigenetics using primary human cells, risk assessment and mechanisms of action. His lab is especially active in technology transfer and product development. Some of his greatest successes include a US EPA registered insect and tick repellent more effective than DEET and a fast acting, natural broad spectrum herbicide among many others. Dr. Roe has been at NCSU for more than 30 years and is a prolific author with more than 250 published papers, 8 books, 36 patents and 10 licensed technologies. He has been an invited speaker for more than 40 scientific events throughout the world and was the organizer of several National and International scientific meetings. He is the president of the company, InTox Biotech, in Middlesex, NC and has served or is serving on the advisory boards for several companies and non-profit organizations in the US. Dr. Roe is also a founding member of the interdepartmental Biotechnology Program at NCSU which provides hands-on courses in molecular techniques and a minor in Biotechnology and has developed new courses at NCSU in physiology, insect morphology, molecular entomology, toxicology, and professional development. Dr. Roe has received several awards for his accomplishments. However, he considers his greatest professional successes and greatest joy in the more than 50 graduate students that he has trained as the committee advisor with M.S. and Ph.D.’s in Chemistry, Biochemistry, Nuclear Engineering, Physiology, Toxicology, Biology, Textile Science and Entomology at NCSU. He has also trained over 20 postdoctoral researchers. His graduates and postdocs have gone on to successful careers in academia, industry and government in the US and literally throughout most of the world. Dr. Roe is married to Janet (Richard) Roe and has a son, Jonathan, and a daughter, Jennifer. His hobbies include work on his farm east of Raleigh, repairs on his MG, camping, and surf fishing on islands off the coast of NC.